I love small projects that I can finish in a day or two. 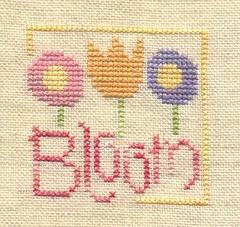 I just finished a Lizzie Kate freebie Bloom. Well not much else... just being pretty lazy today. I didn't get much sleep this weekend because my mom had a stomach bug. She usually watches the kids when I work nights so I can sleep in. I didn't realize how spoiled I had gotten! :) Write more later!